Can’t start your day without a cup—or two—of joe? You’re not alone. More than half of Americans enjoy a daily java fix. For all you coffee lovers, I have some news that’s sure to perk you up: Much of the research out there on coffee (and caffeine) is positive. In fact, studies show that it can not only help to give you an energy boost, but it may also help protect memory and reduce the risk for a variety of diseases. If you’ve been scared off of coffee by some of the negative buzz, let me elaborate a little. Previous studies didn't always take into account that heavy coffee drinkers also tended to smoke cigarettes and be inactive. Obviously, these two habits would affect an individual’s risk of disease and death. But experts are now discovering that the benefits seem to outweigh any potential risks. Those benefits include a brain boost: Two cups a day may help sharpen brain activity and boost memory, both in the short- and the long-term. In one study, European researchers tracked nearly 700 healthy older men for 10 years and found that those who averaged three cups of coffee per day experienced significantly less mental decline than nondrinkers did. Coffee also benefits the body. It may protect against Parkinson’s, Alzheimer’s, depression, type 2 diabetes, and certain cancers. And it could also be a smart pre-workout sip. Drinking a cup within an hour of exercising can boost endurance and performance. There’s no need to become a java junkie. If you don’t currently drink coffee, I would not suggest starting now. There are so many other ways to protect your health—you can skip sipping and still reap these benefits with exercise and loading up on fruits and veggies, for example. Pay attention to your body. Avoid coffee if it makes you jittery, causes headaches, or if it aggravates a pre-existing condition, like Crohn's, colitis, IBS, and insomnia. Also, if you have a heart condition or high blood pressure or you are pregnant, ask your physician if you can enjoy caffeinated coffee. Do a caffeine count. It’s important to pay attention to your caffeine intake if you notice any of the symptoms mentioned above. Levels can vary—a large coffee (20 ounces) from Dunkin’ Donuts contains about 258 milligrams of caffeine while the same amount of java from Starbucks (a “Venti”) contains 325 milligrams. Regular coffee typically has 100 to 150 mg caffeine per cup. Tea offers a more moderate jolt; 8 ounces of tea (green or black) has about 40 mg on average, though black tends to have a little more. Keep in mind that tea may offer similar benefits to coffee, thanks to the combo of antioxidants and caffeine. Stick with a limit. For most healthy adults, up to 400 mg of caffeine is considered safe. If you have trouble tolerating this amount, then adjust your intake accordingly. Take it easy on toppings. Cream, sugar, syrup, and other add-ons can drive calories way up. Some coffee drinks contain more calories than a whole meal! Check out these stats and do some quick calculating to figure out the cost of your coffee: Per tablespoon, milk has 9 calories, half and half has 20 calories, and sugar contains 60 calories. A skim latte from Starbucks is a smart choice with only 130 calories. Or make your own coffee drink at home. Set a caffeine-cutoff. 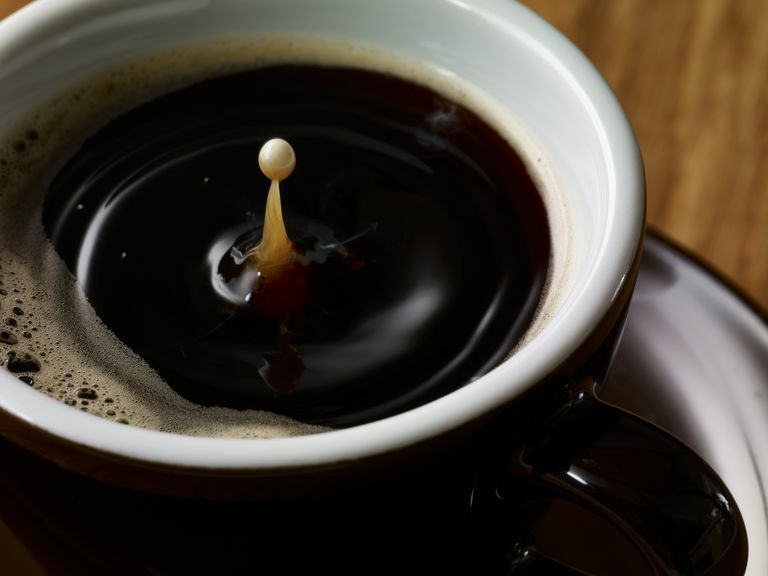 Caffeine tends to stay in your system anywhere from three to eight hours after sipping. Depending on your personal sensitivity, you may want to cut yourself off at a specific hour.